They went to work, laughing and cooperating. I'm a nerd, and I'm in the middle of this slice every day challenge, so I'm always on the lookout for moments. As they ate the batter, my mind went to the concept of process and product. Judging from the giggles and scraped clean bowl, the process was a positive one. Judging from what's left in the pan, I guess the product was good, too! I think it's important to know that there were several girls here last night! Melanie, how special to get to have the girls home! It's nice to have both the product and the process be great! A success on both ends of process and product. Lots of joy can be found in a pan of brownies. Great slice of your life. Who can't resist brownies! It looks like they found the perfect project to do together. 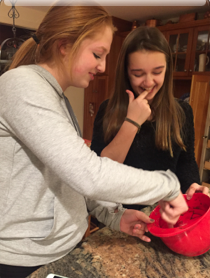 Somehow cooking always seems to bring people together...or maybe it's the brownies! It's always nice to hear about your girls, Melanie, and the word "brownie" caught me, too. Looks as if they loved them as much as I do. Thanks for the happy post! Oh... I need to read your slices to hear that your family continues on. I am so excited for my son, a junior, and all his future will bring. I am so happy for him and want him to love every minute of these next steps in his life. But I also know I will have no kids home in three years and am having trouble seeing what that will be. You are giving me glimpses. Thank you. 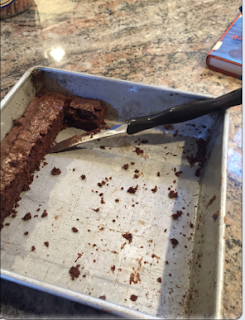 Nothing better than sharing the baking and eating of brownies, unless it's adding a scoop of ice cream. Fun family times are the best! I love that picture of your girls mixing up those brownies. It must be this cold weather, because I've been craving brownies, too!